(18) Thus in different ways threatening him with punishments and such, they taught Prahlâda what the scriptures said about the [first] three goals of life [the purusârthas of dharma, artha and kâma]. (19) After his teachers were convinced that he knew all there was to be known about the four principles [of diplomacy] he, being bathed and nicely decorated by his mother, was taken to the Daitya ruler. (20) Fallen at his feet, the boy was encouraged with blessings by the Asura, who derived great joy from closing him for a long time in his two arms. (21) Putting him on his lap he smelled his head and wetted him with the water of his tears. Then he with a smile on his face said the following, oh Yudhishthhira. (39-40) The sons of Nirriti obeying the command of their leader then with their frightening teeth and faces, their red hairs, mustaches and the sharp tridents in their hands fearfully roared: 'Yeah, let us cut him to pieces!' and with their lances attacked the vital parts of Prahlâda who sat there silently. (41) But just as laudable actions have no effect when they are performed the wrong way, their attack had no effect upon him whose mind was absorbed in the Supreme Absolute of the Fortunate One, the Soul of Each, who cannot be perceived by the senses. (42) Oh Yudhishthhira, the Daitya ruler, alarmed upon seeing how the attempts failed, with determination devised a variety of ways to kill him. (43-44) He tried to crush him with an elephant, attack him with huge snakes, cast spells of doom, throw him from heights, to conjure tricks, imprison him, administer poison and subject him to starvation, cold, wind, fire and water and pile rocks upon him, but by none of these means the demon succeeded in putting his son, the sinless one, to death. With his prolonged efforts having no success he got very nervous. Third revised edition, loaded January 24, 2019. S'rî Nârada said: 'The powerful sage S'ukrâcârya ['the teacher of purity'], who by the Asuras was chosen to serve as their priest, had two sons named Shanda and Amarka who lived near the residence of the Daitya king. The king sent the boy Prahlâda, who was skilled in reasoning, to them in order to be instructed in different subjects of knowledge, together with other Asura children. Hearing and repeating what the teachers all said there, he considered it a bad way of thinking because it was based on the notion of foes and allies. Taken to school, the daitya priests called for Prahlâda and questioned him, while comforting him with a soft voice and pleasant words. 'Dear child, Prahlâda, we wish you all the best, tell us the truth and do not lie. What gave you this wrong way of thinking we do not find with the other children? S'rî Prahlâda said: 'This reasoning about others in terms of foes and allies belongs to people with a material notion of life. Such people, reasoning from what they see, are bewildered about the external affair that is created by Him, the Supreme Lord I respect [see also B.G. 5: 18]. When someone is devoted to Him, the animal notion is destroyed of this time-bound way of discriminating between the 'I' of himself and the 'I' of someone else. For those whose intelligence and service was spoiled by this notion of friends and foes, it is certain that it is most difficult to be of devotional service unto Him, the Supersoul. Even others who are spiritual and follow the Vedic path, are confounded about how to serve Him who transformed my intelligence. 'Oh get us a stick for him, this cinder of the dynasty, who with his corrupted intelligence is discrediting us. This calls for the solution of the fourth diplomatic option of the danda [the rod, after sâma, pacification; dâna, legally settled charity; and bheda, dividing posts]. Thus in different ways threatening him with punishments and such, they taught Prahlâda what the scriptures said about the [first] three goals of life [the purusârthas of dharma, artha and kâma]. After his teachers were convinced that he knew all there was to be known about the four principles [of diplomacy] he, being bathed and nicely decorated by his mother, was taken to the Daitya ruler. Fallen at his feet, the boy was encouraged with blessings by the Asura, who derived great joy from closing him for a long time in his two arms. Putting him on his lap he smelled his head and wetted him with the water of his tears. Then he with a smile on his face said the following, oh Yudhishthhira. 'You fake brahmin! You fool! What is this? Are you siding with the enemy now, so mischievously teaching this nonsense without properly taking care of my boy? S'rî Prahlâda said: 'Persons swearing by a worldly existence develop a life leading to hell, for they fail in their sense control and repeatedly chew the chewed. They are never inclined toward Krishna [see B.G. 4: 4-5] because of what others tell them, out of their own understanding or by a combination of the two [see also B.G. 2: 44]. They who think to gain by the external world have, in their difficult ambitions, really no sense of life's purpose, Lord Vishnu. Even though they follow a lead they, just like blind men led by the blind, obeying the dictates of material nature, are bound to the ropes of her strong power [of mâyâ]. Thus having spoken the son stopped. Hiranyakas'ipu blind with anger out of his mind, threw him from his lap on the floor. Overpowered by indignation he furiously with bloodshot eyes said: 'Men, oh sons of Nirriti [a demon], put an end to his life immediately, lead this boy away to be killed! This one here is the murderer of my brother, for he, this lowest one giving up his own well-wishers, is as a servant at the feet of Vishnu, he worships Him who has killed his own uncle! And to Vishnu he is no good either with his five years of age and his faithless forsaking of the difficult to deny love of his parents. Even being born from others a child constitutes a blessing as beneficial as a medicinal herb, but a son born from oneself who is of evil intentions should be given up like one gives up a diseased limb. For being deleterious to the well-being of the body its removal still allows a happy life. The sons of Nirriti obeying the command of their leader then with their frightening teeth and faces, their red hairs, mustaches and the sharp tridents in their hands fearfully roared: 'Yeah, let us cut him to pieces!' and with their lances attacked the vital parts of Prahlâda who sat there silently. But just as laudable actions have no effect when they are performed the wrong way, their attack had no effect upon him whose mind was absorbed in the Supreme Absolute of the Fortunate One, the Soul of Each, who cannot be perceived by the senses. Oh Yudhishthhira, the Daitya ruler, alarmed upon seeing how the attempts failed, with determination devised a variety of ways to kill him. He tried to crush him with an elephant, attack him with huge snakes, cast spells of doom, throw him from heights, to conjure tricks, imprison him, administer poison and subject him to starvation, cold, wind, fire and water and pile rocks upon him, but by none of these means the demon succeeded in putting his son, the sinless one, to death. With his prolonged efforts having no success he got very nervous. [He thought:] 'With all these unholy expressions and diverse methods, devised to kill him, with all these treacheries and abominations, he found relief by his own strength! Despite being a child, he is in control of matters and afraid of nothing. So close to me he will, just like a mistreated dog, always keep his tail curved and never forget my misconduct. Thus ruminating with his face downward, he lost a great deal of his splendor. Shanda and Amarka, the two sons of Us'anâ [S'ukrâcârya], then spoke to him in private. 'All the leaders of the three worlds who are dominated by you alone, tremble when you lift your eyebrows. You have nothing to fear from him, oh master. We do not understand why you should worry about the qualities and faults of some child. Thus being advised he took heed of what the sons of the spiritual master told him and so it happened that Prahlâda was instructed in the duties of the members of a royal household. Fulfilling religious duties, managing the economy and the regulation of desires was repeatedly in full explained to Prahlâda who was humble and submissive, oh King [compare B.G. 14: 20 & 26]. [But again] what the teachers related to him about the three paths, this education he received from these people taking pleasure in the duality [of friends and foes], he did not consider good [spiritual] instruction at all [compare 6.3: 20-25]. When the teachers were busy with their own household duties the boys of his age there took the opportunity to take him aside. He then smilingly addressed them, in pleasing words telling them with great intelligence and learning how merciful it is to live a better life with God. 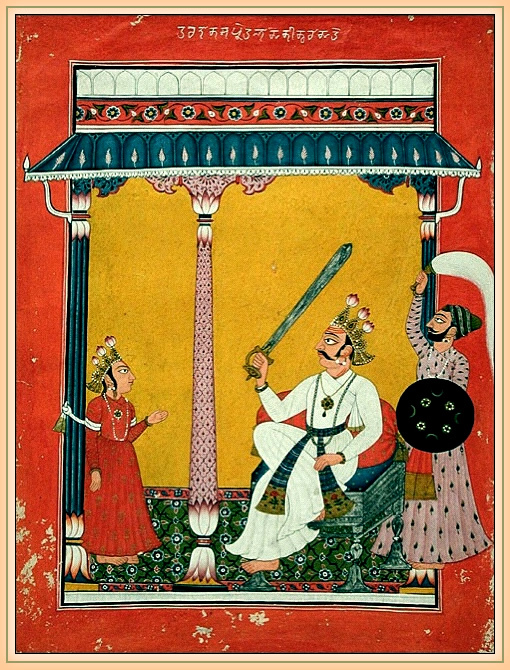 The painting is titled: 'Hiranyakasipu About to Decapitate Prahlada'. India, Jammu and Kashmir, Mankot, South Asia, circa 1725. Courtesy LACMA.